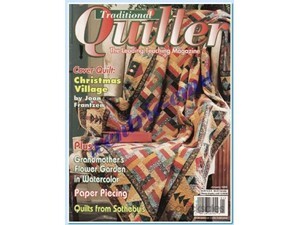 This quilt was inspired by a quilt in the January 1999 issue of Traditional Quilter called, Christmas Village. I started making my quilt just after the magazine was issued so I can easily date this UFO! The quilt in the magazine had the same 3″ rail fence blocks as the center of my quilt. The differences in the two quilts are in the border treatments. Christmas Village had a border comprised of paper-pieced house and tree blocks that were supposed to look like streets in a village. By the time I had the center of this quilt put together I was starting to second guess whether or not I wanted to paper piece the village blocks for my quilt. I decided that a quilt top that has aged on the shelf for 13 years needs to be finished–paper pieced border or not! I added a simple gold inner border and a wide sunflower outer border to finish off my version. This quilt is now 69.5″ x 87″ and was loaded on the long arm Sunday night. I made a pass Sunday night and will take a pass now and then as I have time. Before I know it, this one will be quilted and ready for binding.